As the crisis they manufactured drags on, and the Republican Party sinks to new depths in public opinion, GOP leaders are trying to change the subject. They shut down the government and are threatening to default on the country's obligations for one reason: Their obsession with defunding Obamacare. Now, they want us to think it's all about deficits and debt. 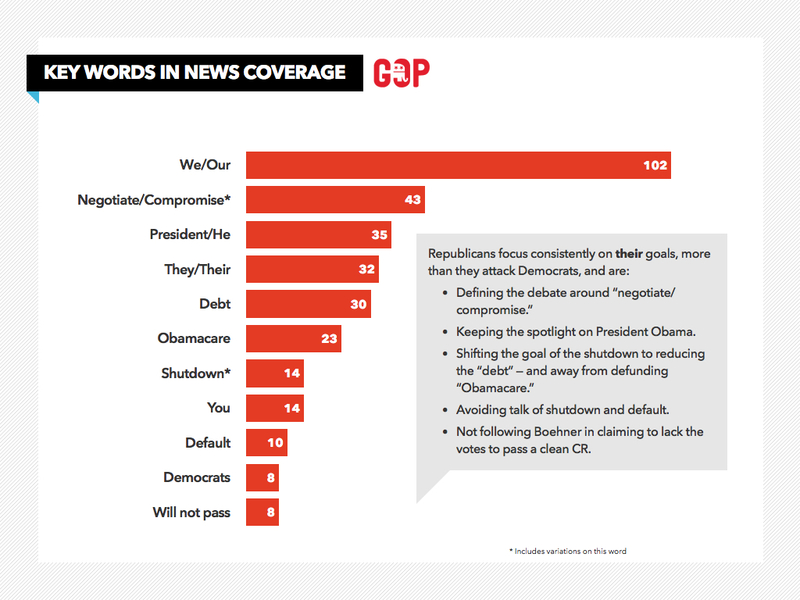 A content analysis of the language used by Republican leaders in news and social media shows "debt" overtaking "Obamacare" in the words most frequently used in GOP quotes and sound bites. As shown in the below "word frequency" chart from our Winning Words analysis, they are also trying to avoid talk of "default." Why is that? First, Americans overwhelmingly disapprove of shutting down the government over health care. A whopping 72 percent of voters disapprove of that tactic, according to a CBS News poll. Additionally, a recent Pew poll shows that 77 percent are concerned the shutdown is hurting the economy. This is the Republicans' Achilles' heel. Democrats should keep the heat on them for causing this crisis -- and for threatening an economic shutdown if they don't get their way on Obamacare. For their part, Democrats need to dial up their message about the true cause of the crisis. 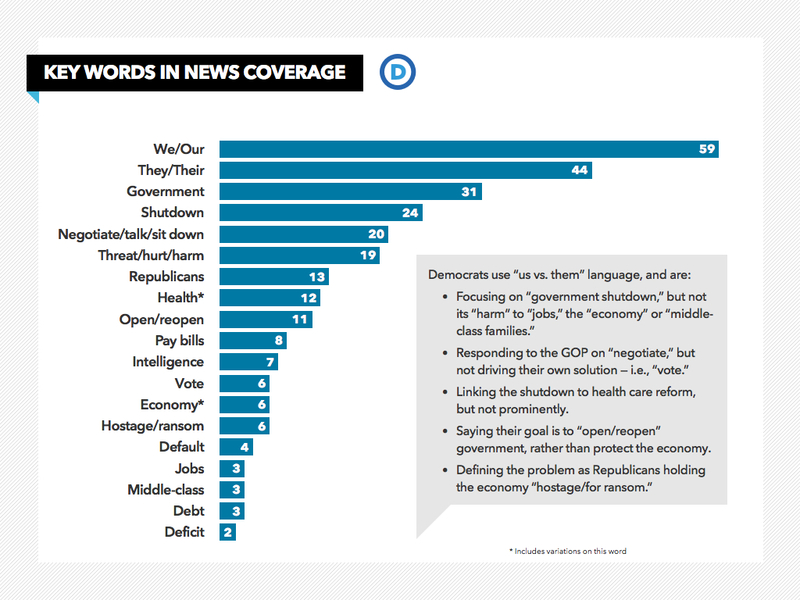 A look at the language used by Democratic spokespeople shows "health" lost in the weeds. Democrats shouldn't let the GOP get away with the bait-and-switch. "The Republicans are holding our economy hostage for one reason, and one reason only: An extreme faction of the party is obsessed with taking away health care benefits from the American people. "Republicans voted more than 40 times to repeal Obamacare, without success. It's the law of the land -- it was passed by both houses of Congress, signed by the President, and upheld by the Supreme Court. "No wonder Republicans are trying to change the subject. They started threatening a shutdown and default explicitly to take away popular benefits from millions of middle-class families." Ironically, shutting down the government over Obamacare just as the program was coming online has helped drive public interest in the program. Millions of people have been going online to find out more about it. Now is a good time for Democrats to talk about the benefits people will get from the reform they enacted over obsessive Republican opposition. And every Democrat needs to put a sign up on the wall in their office paraphrasing James Carville's famous admonition in Bill Clinton's 1992 presidential campaign, "It's the economy, stupid." When it comes to talking about the Affordable Care Act, "It's all about the benefits." Recent public opinion surveys show that people are skeptical of health care reform when it is discussed in the abstract, using terms like the "health reform law." A recent CNBC poll found that "Obamacare" won approval from only 29 percent of respondents (46 percent disapproved) and the "Affordable Care Act" earned only 22 percent approval (and 37 percent disapproval). But when you talk about the specific benefits people will actually receive, it's a whole new story. A poll by the Kaiser Family Foundation found that support for individual benefits ranged from 65 to 88 percent. Two-thirds of Americans surveyed (66 percent) favor the law's guarantee of health coverage despite pre-existing medical conditions. Three out of four (76 percent) were glad to hear that children could remain covered under their parents' policy until age 26. And an incredible 88 percent supported the new tax credits to help small businesses buy insurance for their employees. This is what "health reform" means to real people. Democrats should be talking nonstop about these benefits. And reminding the public that the Republicans shut down our government and continue to hold our economy hostage for one reason only: To take the benefits of Obamacare away from the American people. Doug Hattaway, president of Hattaway Communications, has served as a spokesperson to high-profile leaders such as Secretary of State Hillary Clinton, Vice President Al Gore, Senate Majority Leader Tom Daschle, and successful candidates for the U.S. House, Senate and Governor. Steve Pierce is an associate at Hattaway Communications. He previously worked with the Democratic Congressional Campaign Committee, where he oversaw rapid response efforts and developed messages and media strategies for top-tier U.S. House races in the northeast.